Ever since online casinos rose in prominence, roulette’s simple rules have also made it a very popular game with online players wanting to win real money. Microgaming has answered this demand with European Roulette Gold online, an online roulette app for computers and smart phones based on the European variant with an additional two betting options that are not available in classic Roulette app. European Roulette Gold is part of Microgaming’s Gold series of table games, which also include Baccarat and Blackjack. In each of the Gold series games, special features have been included that set these apps apart from other online apps . Expect a stunning and elegant visual presentation of European Roulette Gold app, which is a custom characteristic of Microgaming apps. The added features in online European Roulette Gold provide players with a unique and exciting online gaming experience. Players will have more betting options available to win real cash and increased control over the game speed, graphics and audio. The game provides players with the possibility of rebetting, where they can replay their last table bet without having to replacing chips. In terms of betting limits, a straight bet cannot exceed $15, split bets cannot surpass $20, square bets cannot exceed $30, and dozen bets cannot be over $70. Playing European Roulette Gold could not be simpler! All you need to do is find an online casino that works for you and open an account. It is a good idea to shop around, as different online and mobile casinos provide different lucrative welcome bonuses that would make your roulette online experience at gambling sites even better. After you have registered, simply log in to the online casino through your mobile or desktop, click on European Roulette online and start playing for real money! The game works just like roulette would work in a live casino. All you need to do is set up your bet amount, then select your numbers and you can spin away.. Furthermore, this game allows players to place combination bets and also provides them with on-screen statistics from previous rounds that they use when playing. Apart from the ‘rebet’ options described above, this game also allows players to place ‘Neighbor bets’, where you bet on the straight-up number you are playing along with the two numbers adjacent to it on the wheel. If you want to win big real cash prizes then a proper roulette strategy will help you go the distance. 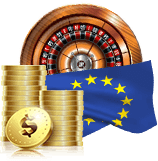 The variant used in online European Roulette will increase your chances of winning as it provides a better chance of winning real cash outside bets. It’s handy to know a strategy off the top of your head when placing your bets and some of the more popular strategies include the Martingale strategy, the Fibonacci strategy, the D’Aembert strategy and the classic James Bond strategy. European Roulette online is absolutely the best choice for new and seasoned online roulette players, on desktop and on mobile. With an easy to understand gameplay and vibrant colors, this game will make online roulette even more enjoyable! The graphics and audio provide a genuine feel to this game that can easily make you feel as though you are sitting in a real casino. In addition to the presentation, online European Roulette also gives players flexible wagers, reasonably high betting limits, and interesting features that enhance the gaming experience on mobile devices, such as smart phone. European Roulette Gold can be easily found on any leading online casino. In order to facilitate this, we have provided a comprehensive list of featured online casinos that have been tested by expert players. In addition, we have also made sure that we list real money casinos that are reliable and secure, as well as offering the most rewarding welcome bonuses! With easy access to online European Roulette from any desktop or mobile device, including smart phone, stop what you are doing and try it today at the top gambling sites!